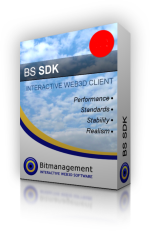 The BS SDK consists of the documentation and tools for the integration of the software in third party products and applications. According to our experience the access to the BS SDK with its substantial documentation and tools is important for proper integration of the BS Contact viewer in third party products and concepts in order to reach the optimal rendering performance, the utilisation of interactivity and animation as well as connecting the applications to backend systems. The documentation assists in preparing the content for optimal online use.